BSkyB spokesman: "We're a broadcaster not a bank"
LONDON, England (CNN) -- UK broadcaster BSkyB said Wednesday that it had refused a request for a £50 million ($82 million) lifeline from troubled Irish sports pay-TV broadcaster Setanta, as it seeks to avoid administration. 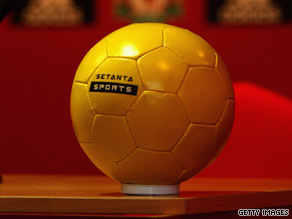 Setanta is believed to have around 1.2 million subscribers, 60 percent less than it requires. BSkyB, which is part of Rupert Murdoch's News Corporation, was offered the live rights to 46 English Premier League football matches next season as an add-on option to its Sky Sports service. It already holds four packages of rights to show a total of 92 games next season. BSkyB Spokesman, Robert Fraser, told CNN that "BSkyB and Setanta held talks some weeks ago about a possible deal where by BSkyB would retail Setanta's channels to satellite costumers on Setanta's behalf. As a condition for such a deal Setanta requested an upfront payment of £50 million and BSkyB declined." Fraser added: "We are very opened to discussing an agreement with Setanta but we are a broadcaster not a bank." Setanta is experiencing a funding crisis with a payment of more than £30 million ($49.2 million) due to the English Premier League this week and backers refusing to advance them any more money. The Irish broadcaster, which shows golf, rugby and cricket in addition to football, is also trying to renegotiate its multi-million dollar sponsorship agreement with the Scottish Premier League. A number of club chairmen in Scotland's top division recently stated that the collapse of Setanta would be catastrophic for a number of clubs. Setanta is believed to have around 1.2 million subscribers, almost 700,000 less than it needs to "break even." It is losing up to £100 million ($164 million) a year as a result, according to the BBC. In a further blow to the company, BT Vision, the home digital TV service, on Wednesday moved to suspend any new sales of Setanta Sports. "We are closely monitoring the situation with regard to the current position of Setanta Sports," BT Vision said in a statement. "As a precaution we have currently suspended any further sales of Setanta Sports from this morning." A message on Setanta's Web site said that it is still broadcasting but it is not now possible for new subscribers to sign up to their services. British football has experienced the sudden loss of television revenue before. In May 2002, the collapse of ITV Digital threatened the existence of a number of lower division clubs in England that had relied on the digital television company's sponsorship money. According to the British Press Association, U.S. cable broadcaster ESPN is favorite to step in and take over Setanta's Premier League games if they go into administration but they refused to comment.